As part of The Grey Ops 10k Challenge, Grey Ops will be running articles this week on how to improve your fitness level for Paintball. Bear in mind that the field of exercise science is vast, and mostly beyond the scope of our humble Milsim Paintball blog. These articles will be very generalized, but will provide enough information to get you started on the right track in your quest to become a fitter and more effective player. For a better understanding, conduct your own research into the concepts discussed in this series. As always, consult a physician before engaging in any fitness program. This article in the Paintball Fitness series will concentrate on Cardio-vascular endurance. As I discussed in the introductory article to the series, a higher level of endurance will allow you to stay in the game longer, and be a more effective player for your team. As Paintball is played on your feet (and because the 10k Challenge is a running-based event), this article will focus on running for improving cardiovascular endurance. If you suffer from some sort of injury or illness that hinders your ability to run, the same principles would be applicable to exercise bikes, elliptical trainer machines, and other "cardio" activities. First, we'll focus on what constitutes cardiovascular exercise. "Cardio" refers generally to exercise designed to stress and improve your body's tolerance for prolonged, low-to-medium intensity physical activity. Because all challenging exercise, from powerlifting to sprinting to swimming, works your heart and vascular system to some extent, using the term "cardio" to describe endurance training is a bit of a misnomer. The main characteristic of this form of exercise is that it's aerobic in nature, meaning that your body uses oxygen extensively to power the activity. Examples of aerobic activities are jogging, swimming, and biking. These activities cause the body to use mostly fat as fuel, with the help of oxygen you breathe to burn it. The more intense an exercise activity gets, meaning the closer it gets to your physical limits, the more anaerobic it gets. "Anaerobic" literally means "without oxygen", and it describes activities where the body uses sugar and other subtances in muscle cells as its main fuel source. Examples of activities that are anaerobic are sprinting and weight training. The body can burn sugar in your muscles and liver (AKA glycogen) as fuel, and delay needing oxygen until after the activity (which manifests as oxygen debt - that feeling of being winded after a hard sprint or other intense burst of activity). There's no such thing as a purely aerobic or purely anaerobic activity. Because of the way your metabolism is set up, your body will burn some of each during any activity. The more intense an activity is, the more your body will tend towards burning sugar/glycogen, the high-octane jet fuel of metabolism. The less intense an activity is, the more the body will resort to burning fat, the plentiful "regular unleaded" fuel in your body. Okay enough of the technical stuff, and on to what you actually need to know and do to improve your stamina/endurance! There are 2 main types of "cardio" that are relevant to training for endurance: steady-state training and interval training. Steady state training is your regular, run-of-the-mill endurance exercise. It's aerobic exercise at a low to moderate intensity level, where you hit the road or treadmill and jog for a given amount of time, at a uniform pace for the duration. It's what most most people are used to when it comes to "cardio". There are two ways to progress using steady-state training. The first is to try to increase your total distance traveled. Keeping the same pace, you could run 3km one session, then 3.5km the next, then 4km the next session, and so on. As each session progresses, the total time involved in the run will increase as well. At a certain point however, you may not have the time to dedicate to running further. If running 5km takes you 30 minutes (a pace of 6:00 minutes per km), and you don't have the time available in your program to run for longer, then another way to progress using steady-state training is to increase your pace. Instead of taking 6:00/km, increase your pace to 5:45/km. When you're running 30 minutes at 5:45, increase your pace to 5:30/km, and so on. Keeping track of your pace can be done in hindsight, by calculating the total distance you traveled in kilometres (Google Maps is your friend), and dividing it by the time you took to complete the run. But for those who want to keep track of their pace while actually running, there are products on the market for this. 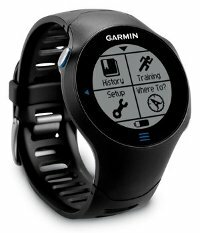 Garmin sells a wristwatch-style GPS product called the ForeRunner that displays your pace in real time. Smart Phone users can download a free app called RunKeeper. You can use RunKeeper to keep track of your current pace, and total distance traveled via your provider's Location Services. 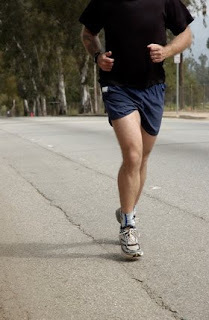 If you can, work up in duration to 45 minutes 2 to 3 times per week to improve your endurance. If you get to the point where you can run for an hour or more, try not to go over that one-hour mark too often though. For most people, endurance exercise past about the 1-hour mark can be catabolic, and cause your body to break down muscle tissue to fuel your activity. Interval training is a form of endurance training that involves varying the intensity and pace of your activity. It's generally characterized by periods of relatively easy activity, punctuated by bursts of high-intensity, near-anaerobic activity. The Tabata Protocol, Fartlek (yeah that's Swedish), and High Intensity Interval Training all refer to this general category, each with their own little differences in execution. An example of interval training would be jogging for 30 seconds, then running as fast as you can for 15 seconds, then repeating the cycle. During the 30-second jog, your heart rate would be at a level similar to what you'd experience during steady-state endurance training, but the 15-second sprint would be a shock to your system that would drive your heart rate up suddenly. Interval training can be pretty brutal, because you're never fully resting. Using the example above, by the end of the 30-second break, your heart rate is just starting to slow down when ****BOOM**** it's time to sprint again! There is a bright side to this type of training though. Because it's more of an exercise stressor on your body than steady-state training, it's a lot more effective. Some trials have shown 20 minute sessions of interval training to provide equivalent health benefits to an equivalent number of 45 minute sessions of steady-state endurance training. It's a real time-saver, IF you can push yourself to withstand the discomfort, and maintain the work ethic required. A lot of people might prefer to do steady-state activity instead, finding interval training too hard, and that's fine. Keep in mind however that interval training is more specific to Paintball, due to the stop-start nature of the game. In a fast-paced round you sprint to a bunker, catch your breath and take some shots, duck, then sprint to another bunker trying to get a better position, repeat. It of course wouldn't be as intense as an actual dedicated interval training session, but it mirrors it a little bit. To improve/progress using interval training, gradually add more "cycles" to your session. Using the example I gave above, you may want to start small, doing 5 cycles of 30 seconds easy/15 seconds hard. After a week of that, you can add in another cycle every week, until you hit the 20-minute mark. Once you're at that level (I wouldn't recommend doing interval training for more than 20 minutes per session if you like to keep your lunch in your stomach), you'll need to make your sessions more intense. To do this, gradually reduce the recovery portion of the cycles; for one week, instead of doing 30sec/15sec, do 25sec/15sec. After a couple weeks of that, try 20sec/15sec. Whichever of the 2 methods you use to train for endurance, to improve you always need to try to do a little bit more than last time. Remember the principle that I explained in the introductory article to this series: Unless you constantly push yourself to improve, you won't! But for your own safety, always push ahead in small increments. If you manage to run 5km at a 6:00 pace, at the next session push yourself to do 5.5km at a 6:00 pace. There's no need to rush things, and overextending yourself by adding something like 2km or 5 interval cycles from one session to the next could lead to you getting injured - so take it easy! Realistically, if you're in half-decent shape already, and consistently follow an endurance training program that focuses on running 2-3 times a week, there's no reason why you can't run 10km in one session after around 6 weeks of disciplined training. Mind you, a few other things in your lifestyle have to be in place for it to happen that quickly, but I'll cover those in future installments of this series. As important as training is, equally important is leaving time between sessions for your body to recover and improve. During a hard session of endurance training, joints and muscles take a beating, and need time to heal. As much as possible, try to leave at least 48 hours between training sessions to allow this to happen. Just as we focus a lot on the right gear to play Milsim Paintball, we need to choose the right gear for our endurance training. The most crucial piece of equipment for running is your footwear. The right shoe can turn you from a slow, plodding oaf to a swift gazelle. I used to run occasionally in Nike cross training shoes, and noticed a HUGE difference when I invested in a good pair of shoes purpose-made for running. Head to a sporting goods store and put some money into the right shoe. Saucony, New Balance, and Asics tend to specialize in running footwear, so start by trying on models from those manufacturers. 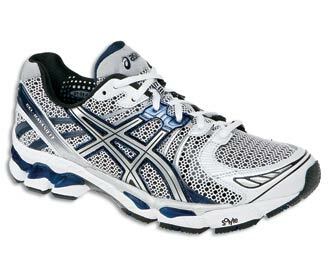 If your feet tend to roll excessively inward when you run (overpronation), ask the sales staff about stability shoes. These have special plastic inserts and high soles on the instep to keep your feet in line and prevent ankle rolls as you run. Wear proper clothing for your run. Shorts and a t-shirt may seem like the logical choice in summer, but during the other seasons this can be pretty tricky. In cool weather cover up for the start of your run, but make sure you can pull down the zipper, open up the cuffs, or remove things like hats and gloves as you warm up to prevent overheating. Speaking of overheating, a bottle belt or Camelbak is essential if you plan to run distances over 5k, and/or in the heat. Being able to stay hydrated can prevent a lot of problems. If you plan to prepare for the Grey Ops 10k Challenge on a treadmill, keep in mind that the skill and form involved in treadmill running is a little different. 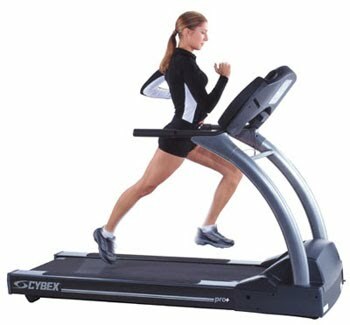 While you need to propel yourself forward on the road, on a treadmill the running surface actually passes under your feet. In practice this means that a treadmill is more about staying in the air than about pushing your body to move ahead. If you train on a treadmill, when you actually start running on a road or track, you'll fatigue quickly as the muscles that push you forward haven't been used as much. 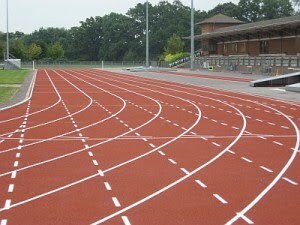 On the subject of form, I urge everyone who intends to practice distance running to attend some form of running clinic, even for one introductory session. There, an instructor can take a look at your running form, and recommend tips for improvement. As for the location where you train, and the time of day you do it, here are some things to keep in mind: fumes from cars can reduce your performance and damage your lungs, so try to avoid main streets when running. If you live in the city and can't follow that advice, at least run early in the morning or late in the evening, when the fumes from vehicle traffic have settled or been blown away by wind currents. Run on a track at the park if you can, but if you're forced to run on a street or sidewalk, stick to areas that aren't too badly slanted. All sidewalks and roads lean to one side for proper water drainage, but if it's crooked enough that it puts more stress on one ankle or hip than the other, you could be in for some problems. Last but not least, as you get older and Paintball starts to take a back seat in your life, try to shift your endurance training activity to elliptical trainer machines, swimming, exercise bikes, and other low-impact activities that won't hammer your aging knees and hips! Seriously, you want those to last you a long time! In the next article in the Paintball Fitness series, we'll examine how best to develop strength. Stay tuned!